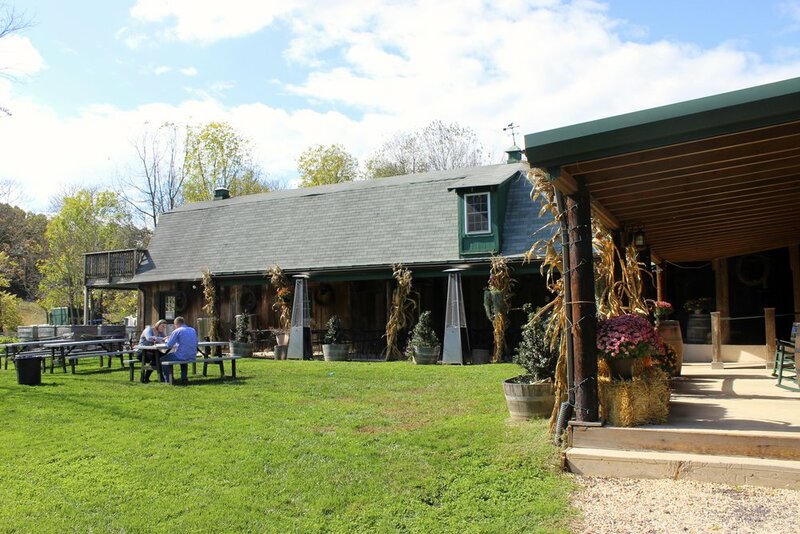 In the far northern reaches of the Middleburg American Viticultural Area (AVA), just off of Route 9, near Waterford, you will find 8 Chains North Winery. 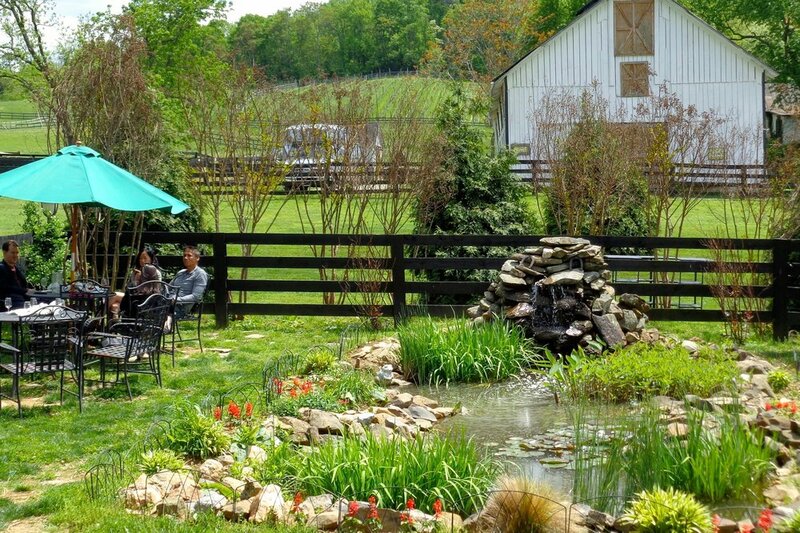 Its one of a cluster of small, boutique wineries that dot the landscape of Loudoun County. In recent years, these small vineyards have been springing up all over Northern Virginia in response to the demand for local wine by oenophiles in Metro D.C. The "8 Chains" name is a reference to a unit of measure used by surveyors. As the story was related to me, during the Civil War, the Confederate Army was encamped on the current site. The crossing point of a nearby creek was said to be 1.8 chains north of the encampment. Calling the winery "One Point Eight Chains North" just seemed like too much to remember, so the reference was shortened. I can't attest to the factual nature of this story, but it does make for a catchy name. Ben Renshaw is the owner and winemaker at 8 Chains. He released his first vintage under the 8 Chains label in 2007 and the tasting room opened in 2009. Ben has twelve acres under vine at two different vineyard sites and purchases additional grapes locally. The winery currently produces about 2500 cases per year. The white varietals used at 8 Chains include Traminette, Vidal Blanc, Sauvignon Blanc and Albariño. You don't encounter much Albariño in Virginia. The winery has just recently planted the grape, so juice for the 2011 vintage was sourced from the Rias-Baixas region of Spain. I found it interesting, but I'll be very curious to taste the wine produced from local vines. My favorite offering from Virginia grapes was the 2011 LoCo Vino. This blend of Traminette and Vidal Blanc as about .5% residual sugar, a floral nose and lots of tropical fruit. It's a well-crafted wine. The red grapes are primarily Bordeaux varietals. I noticed that Tannat was used as a blending grape in the Furnace Mountain Red, which is traditionally a Bordeaux blend. I'm sure that was to give legs to that 2011 vintage. My favorite red and, I will argue the best wine on the tasting menu, was the 2010 Merlot. My contention that Merlot is a blending grape has really been challenged by the 2010 vintages. Wine Enthusiast gave this one 89 points, which is the highest ever for a Loudoun County Merlot. Twenty two months in French and American oak imparted a beautiful bouquet with bright cherry notes and nice round tannins in the finish. It's an exceptionally good wine. There was a pretty good crowd at 8 Chains, but there are multiple tasting bars and plenty of staff to handle the traffic. Sean poured wine for me during my visit. I found him to be friendly and informed. He was able to answer all of my questions and expounded upon the wines without appearing to recite from a script. We had a nice conversation about 8 Chains and other neighboring wineries. I had a great visit, did not feel rushed and really appreciated having the full attention of the wine steward. I spent some time looking at other reviews and ratings rendered by other visitors. Everything I read was positive and most patrons love this winery. There seems to be a very devoted following. If you're exploring the Middleburg AVA or just happen to be in the neighborhood, 8 Chains is worth a visit. 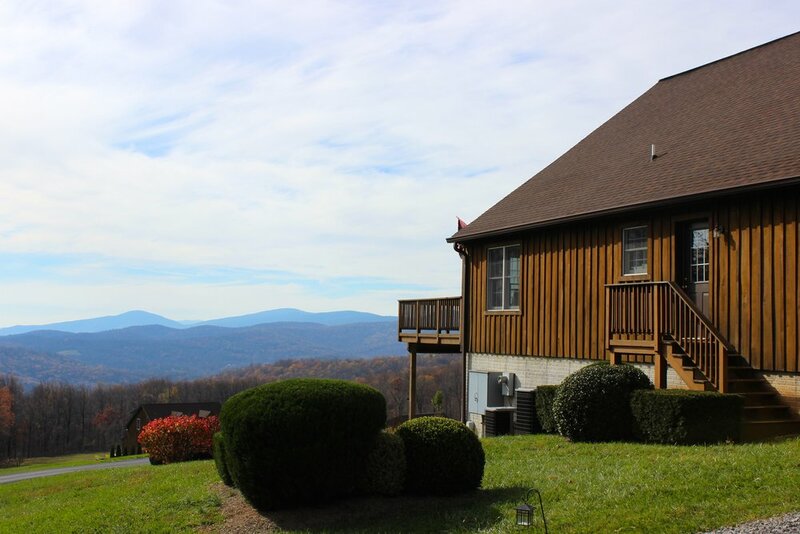 Just outside the village of Aldie, on the hillside north of Route 50, you will find perhaps the best view in Loudoun County, Virginia. Looking south at the Bull Run Mountains, it is difficult to imagine a better spot. It is on the crest of this slope that you will find 50 West Vineyards. The south-facing aspect is ideal for grape cultivation and for sitting outside the newly renovated tasting room with a glass of wine. This location was previously home to Leaves of Grass Vineyards until the owners put it on the market. The property began to lapse into decline before it was purchased by Mike and Diane Canney of Sunset Hills. It is our good fortune that the lot found owners interested in keeping it part of the wine space. It was rescued from development and remains a part of the local cluster of wineries. So the tasting room and its gorgeous view will remain a winery stop for visitors to the area. That works for me. On the property is also a home that a belonged to the previous owners. This mid-century modern structure will be converted into a club and event space. It does not look like much right now, but after the space is remodeled and opened up, the large south-facing windows may offer the best view on the property. Significant work has already been done to clean up the exterior landscaping and the pool has been restored. This has taken place over only a few short weeks. It will be very interesting to see how this structure evolves in the coming months. Diane Canney was in the tasting room when I visited and she took some time to answer questions, show me around and talk about future plans. The tasting room is currently pouring Sunset Hills wines, but a line of unique 50 West wines will begin to make its way onto the menu. The first will be released as early as October, which gives me an excuse for another road trip. After Diane and Mike took over, only minor cosmetic upgrades were necessary in the tasting room. The upstairs, however, will be renovated and used for seating and tasting space. Of course the the property contains multiple sites for vineyard expansion, which will bring the Sunset Hills total to somewhere between 80 and 100 acres. The 1.5 acre plot not the south side of the tasting room has already been replanted. The Canney’s just don’t waste any time. I am certain that next year will see more planting on the property. I am both impressed and excited by the developments at 50 West Vineyards. On top of all the renovations and upgrades, the owners have installed a trained, professional staff. This is a winery that complement the other five wineries in the local cluster and add to the local wine tasting experience. Stay tuned over the next year or so and I will keep you up to date on developments. In the mean time, if you make it out there, let me know what you think. Driving north on Harper’s Ferry Road, toward the Potomac and the tri-state border of Virginia, West Virginia and Maryland, you will pass four wineries. 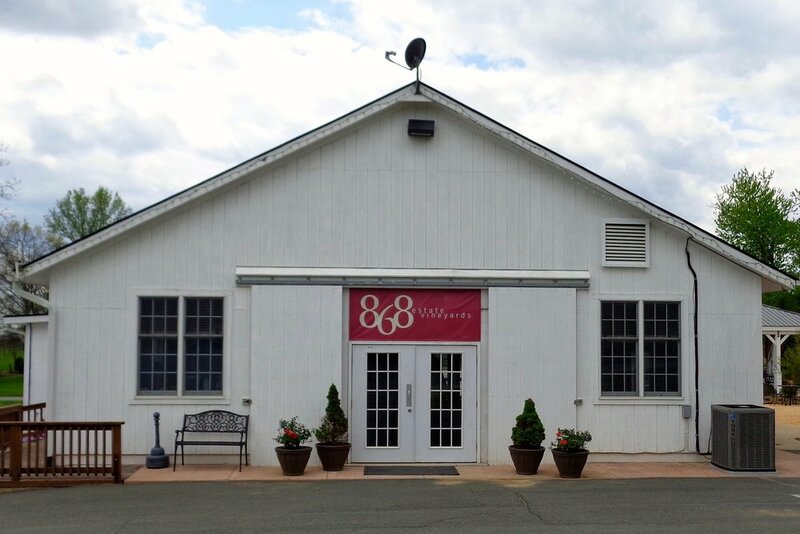 Here in this little valley, tucked in between the Blue Ridge and a smaller ridge line known as the Short Hills, you will find 868 Estate Vineyards. The winery takes it’s name from the elevation of the valley’s tallest hill that shares part of the 120 acre parcel along with the vineyard and winery. I’m told, there is an unobstructed view of everything in the valley from the top of the hill, but this terrain feature is far from the property’s only attraction. The acreage was originally a working farm dating back to the early nineteenth century. Many of the outbuildings and the old Conrad House, which was built in the 1840’s, are a few of its remaining features. The 868 property also contains a Monarch way station, where milkweed is cultivated each year to attract the butterflies. As if that’s not enough, directly across from the tasting room, is the Grandale, which is one of Virginia’s top-fifty restaurants. Basically, it’s just a gorgeous tract of land with many things to see and explore. I was able to talk at length with both Peter and Nancy Deliso, who are two of the owners. Nancy filled in many of the winery details and Peter walked me around the property pointing out all of its various features and talking about the future of 868. Nancy explained that six more acres will be added to the ten currently under vine. The goal is for the wine to be produced from 100% estate grapes and a new winery just opened on the premises with a capacity of 5000 cases per year. Peter would like to see production eventually expand to 10,000 cases and then evaluate next steps. There is room for an additional winery building and many more acres of vines on the property, so it will be interesting to see how 868 evolves in the coming years. Carl DiManno is the winemaker at 868 and also owns part of the business. He, graduated from U.C. Davis and worked at several Napa wineries before transitioning to 868. The vines will not produce their first vintage until this fall, so Carl has been working with fruit from other vineyards. I found all of his wines to be well crafted and I can’t wait to see what he does with the estate grapes. There are three different tastings offered at 868: wine only, wine and chocolate, or a food and wine pairing. The pairings sound interesting, but we went for the standard tasting. There were seven wines on the roster and we were lucky enough to try an additional wine not listed on the menu. So a total of eight wines and they were all quite good. Of the whites we tasted, the Chardonnay was my favorite. It spent six months in French oak, which was enough to give it some creamy notes without covering up the fruit. It displayed nice balance and a great mouth feel. It’s a definite winner. Among the reds, I loved the Cabernet Franc, but then we were served the Reserve Cab Franc. Wow! I ran out of room on the tasting menu. I had to continue my notes on the back. This one is unfiltered and unfined with a beautiful cherry aroma and more cherry on the palate. It had quite a bit of complexity and a little bit pepper in the finish. I thought it was a fabulous wine and my absolute favorite of the tasting. Our wine was poured by Sam, who is a student at Shepherd University just across the border in West Virginia. College students working at wineries typically recite a script and are unable to answer questions beyond what they’ve memorized. Sam was a pro. Kudos to 868. They either trained her well or made a great hire. She guided us through each of the offerings, adding insights about the wines and engaged us in conversation. It was just the type of tasting I'm always hoping for. Very well done. So what more can I say. It was a great visit. We’re planning to return for dinner at the Grandale and, as I said, I’m excited to see what happens when they start harvesting their own estate fruit. If the wine and varied features of the property are not enough to lure you out there, 868 hosts numerous public events. You’ve got to see it for yourself. I stopped in at Arterra Wines back in February for their grand opening. I like to check in on these new wineries more frequently, because there is a high level of probability that things will change more quickly than with an older, established winery. If you did not read my last Arterra writeup, I should provide a short orientation. Jason Murray and Sandy Gray-Murray own the winery and tasting space. Jason is the winemaker. Sandy is an artist with a very earth-oriented style. So the name Arterra means “art of the land.” It is a bit of a double entendre, since both Sandy’s art and Jason’s wine are art and products of the earth. The tasting room serves as both a place to sample Jason’s wine and a gallery to display Sandy’s art. The combination makes Arterra a destination unlike any other Virginia winery. Eight acres of vines were planted just last May, so it will be years before we can taste any estate wines. When that time comes, we are in for something of a surprise. In addition to many of the typical varietals, Jason has planted Malbec, Petit Syrah, Chenin Blanc and Tannat. The current plan is to produce about 1200 cases per year and concentrate on the highest possible quality. If you taste the wines currently being poured, you will have every reason to expect amazing estate wines. With the exception of the Riesling, which is sourced from the Finger Lakes, the other fruit is from Loudoun County. So you will taste primarily local Virginia wine. Jason pointed out that the wines I tasted on my previous visit were maturing very nicely, so I felt compelled to give them a try. Well, where wine tasting is concerned, it is not as if anyone ever needs to twist my arm. And he was right, of course. The wines were drinking very well and were markedly better than they were ten months earlier. I concentrated exclusively on the reds and only tasted three. The Cabernet Franc is a little bigger than most Virginia examples, with great fruit and complexity. The Petit Verdot, I have to say, is simply amazing. I am frequently disappointed with single-varietal PV and I am of the opinion that it is often best as a blending varietal, but the Arterra PV is just over the top. It is big and full of dark fruit, of course, but everything about it was simply amazing. From nose to finish, it is a winner. And then there is the Tannat. Jason’s super power is all about making great Tannat. It is another big, inky wine, but has enough time in oak to tame the tannins. It is a beautifully constructed wine full of dark fruit and with plenty of aging potential. It is brilliance in a bottle. No exaggeration here. You have to try it. So yeah. If you are serious about Virginia wine and you have not visited Arterra, you are missing out. This is one little gem, that will not remain a secret very long. So get over there sooner rather than later and when you do, let me know what you think. n addition to wine, Northern Virginia is horse country and this is particularly evident as you drive the backroads of Fauquier County. Aspen Dale Winery embodies both regional aspects. 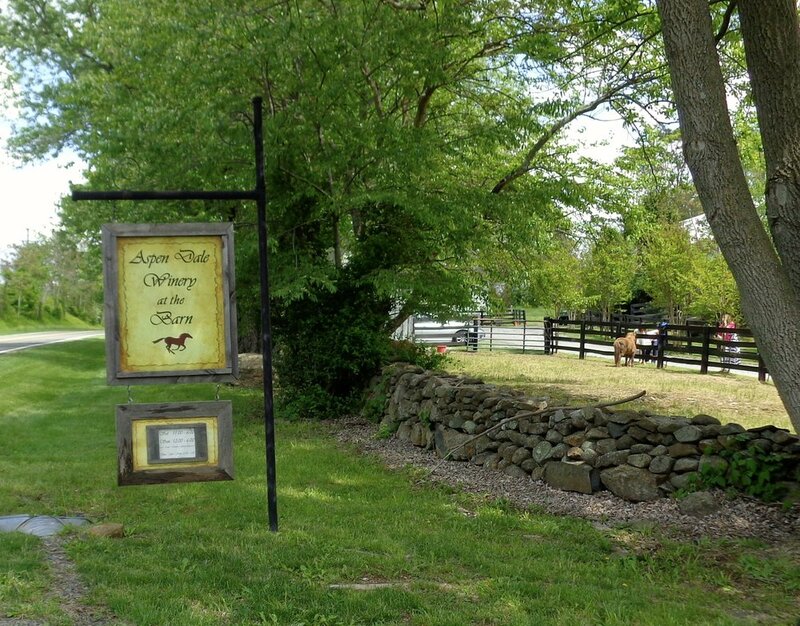 In addition to winemaking, Aspen Dale is located on a historic fifty-acre working horse farm. The property contains an eighteenth-century manor house and the tasting room is housed inside a restored 200-year-old barn. It’s a beautiful property and one that compels guests to linger on the grounds. Aspen Dale is a fairly recent small boutique winery that only came on the scene in 2009. Most of the grapes are locally sourced, but about the 1.5 acres of vines were planted in 2004. Despite the relative youth of the winery and tasting room, I’ve read and heard some very positive things from other wine writers. So I was excited to stop in and see what this winery was all about. The winery is producing a range of well-crafted small batch wines and serving them in the tasting room. There were six wines being poured and the tasting is arranged as a food and wine pairing. A small plate of tasty morsels is provided and there one food item for each of the wines. My server was a college student and a part-time employee at Aspen Dale. As she poured, she did her best to explain each wine and point out which item was meant to be paired with the wine. Only a handful of Virginia wineries are conducting tastings as a food and wine pairing and a couple more offer it as a tasting option. I’m a huge fan of this type of presentation, because I think it is an excellent educational tool. I applaud Aspen Dale for providing this experience to their visitors. I have, however, seen it done much better at other wineries. It requires a slightly more sophisticated or better trained staff member to pull off the tasting and I thought the presentation was lacking. I always agonize over a negative comment and this was honestly just a low point in what was otherwise a very nice visit. On a much more positive note, the wines are excellent. I particularly enjoyed the Bridgetown, which is a Bordeaux-style blend, but the Rockawalkin’ 2009, was even better. This Cabernet Sauvignon was showing red fruit and a bit of oak on the nose. On the palate it had some earthy qualities that were laced with more of the fruit notes and little pepper in a finish that just went on and on. It was a beautiful wine. Would I recommend Aspen Dale? Absolutely. The property alone is worth the visit and the wines are exceptional. There is frequently live music in the tasting room and plenty of space to linger inside and out. Add this one to your list. I see Barrel Oak Winery (BOW) all over social media. They have a strong, aggressive presence and I interact with them frequently in that space. It had been more than two years, however, since I last interacted with them in their physical space, so I was way overdue. 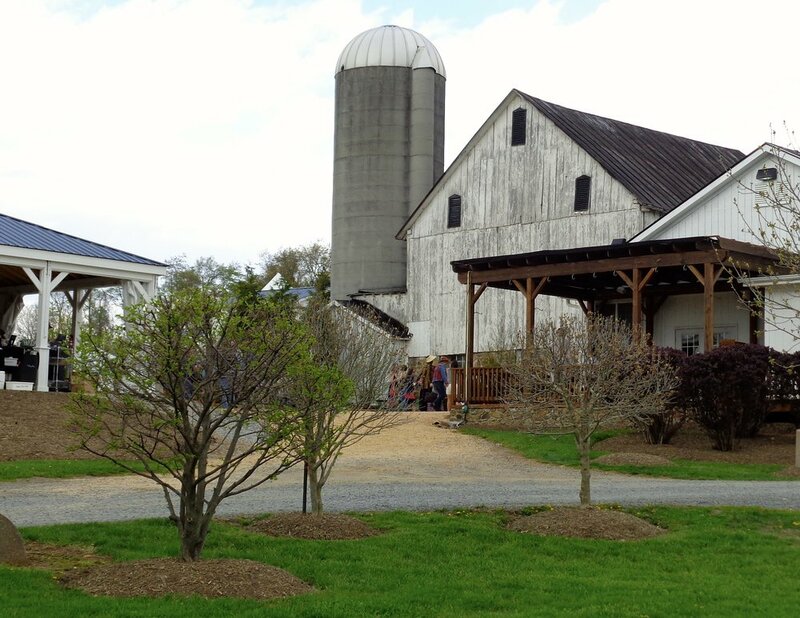 It is a winery that is often unfairly maligned for being something of a busy weekend venue for visitors from the Greater DC area. There is a perception, by some, that the emphasis at Barrel Oak is on entertainment rather than wine. I want to dispel that notion. It is true that Barrel Oak draws a crowd. They welcome and even encourage dog owners to bring their pets. Dogs are allowed in the tasting room. Canines are a presence throughout the grounds. They also welcome families and you will see children playing in and around the picnic area. There is frequently live music. During the summer months there is a Sangria bar. The parking lot is always full. Based on this information, some oenophiles might infer that all of this will detract from the tasting experience. That has not been my experience. I have visited BOW on two occasions in different seasons. 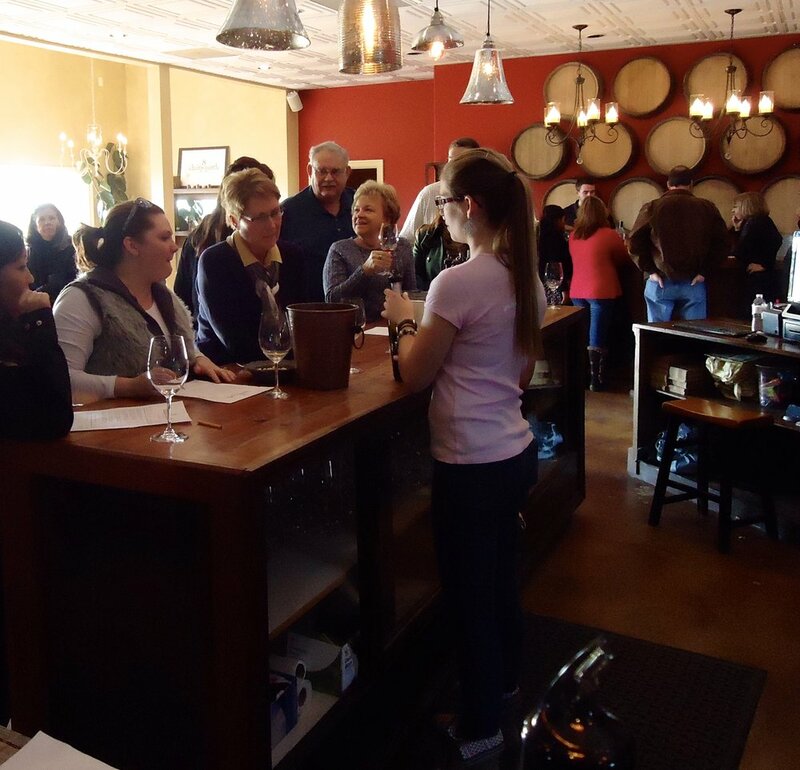 During each visit, there was a large crowd, but that throng is dispersed among multiple tasting bars and there is ample staff to ensure that the tasting is not rushed. I joined another group at the main, indoor bar for my tasting. So my treatment was not preferential. I had a nice relaxed tasting and engaged both the wine steward and other patrons in a conversation about the wines as they were being poured. I found the server to be both customer oriented and knowledgable. From the standpoint of customer experience, it was first rate. That’s all good, of course, but what about the wine? I tasted a total of ten BOW wines during this most recent visit. They start with a New Mexico Gruet sparkler, which is a great wine, but not one I am inclined to write about in this review. The whites were limited to an estate and a barrel Chardonnay. Both were well crafted, but the real story is in the red offerings. The Meritage and Cabernet Franc are both worthy of mention, but there are a couple others that I feel deserve your attention. Last time I visited, I went on at length about the Cabernet Sauvignon, so I was anxious to try that single varietal again. Let me just say that the 2013 Cab is simply “killer.” It is a big, inky, jammy wine with a lot of fruit and a long finish. Is a distinctly excellent Virginia Cab. As I was basking the afterglow of the Cab, my server poured me a dollop of the 2012 Petit Verdot. As I have pointed out in the past, I am frequently disappointed with single-varietal PV, so I have to comment when I try one that gets my attention. The BOW example was definitely one of those. It had a little cigar box and black fruit on the nose and it is a big wine with firm tannins that do not mask the fruit on the palate. It is a fabulous wine and one you will want to try (or even take home). It is likely that some pundits will continue to write derisive things about BOW. After all, as they say, “haters gonna hate.” Perhaps you are looking for something a little more low key and I get that. I do encourage you, even if you do not care to hang out, to just stop in for a tasting. The wines are definitely top shelf. On the other hand, if you are looking for a venue that is upbeat and full of positive energy, Barrel Oak should be on your short list. Regardless of your wine-drinking demographic, after you stop in, let me know what you think. 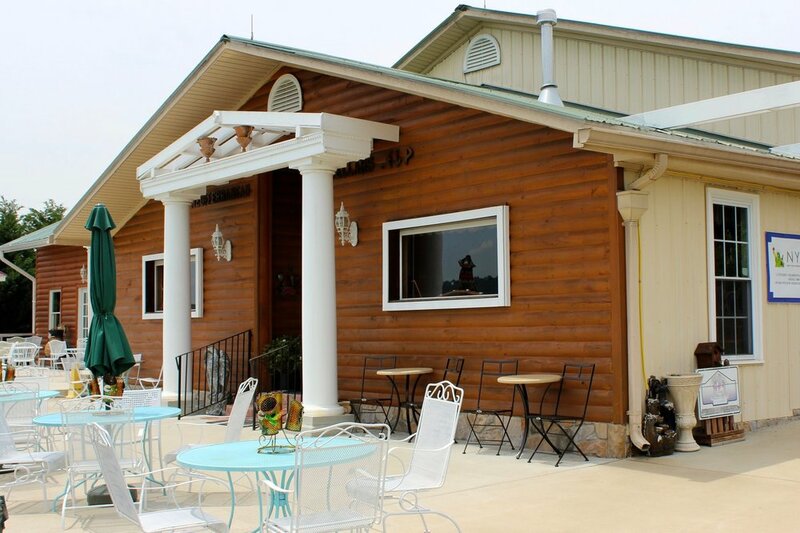 If you are looking for a winery that offers tastings in a grand style, you need to check out Blue Valley Vineyard. The palatial tasting room and winery complex seemed to be years in the making, but the Zissios family is finally open for business and it was worth the wait. You are certain to be impressed by the level of detail. Oh, and as an added bonus, the views are among the best in Fauquier County. If nothing else, you need to drive out there for the jaw-dropping vistas. When I arrived there were three busses in the parking lot. This is seldom a good sign. So I braced myself and went inside expecting to encounter a crowd at the tasting bar. There were customers at the tasting bars and on the patio, but I am still not sure where they hid all the people. The traffic was well dispersed, I was able to immediately belly up to the bar and I was well attended to by a very enthusiastic wait staff. This level of efficiency is all the more remarkable, when you consider that the tasting room opened only three months earlier. I have visited tasting rooms more than a year after launch, where they are still ironing out the kinks. Just sayin’… Kudos to Blue Valley. Now, there is one caveat. Despite having twenty acres under vine, the fruit is still too young to produce wine. In order to open, the Zissios family imported juice from the west coast. The 2015 harvest will produce the first estate wine. So we will see some Blue Valley whites next year and the reds will follow. The California juice provided material for a dress rehearsal and I am happy to pronounce that it was a success. The four rosés, three whites and four reds were all well-made and infinitely drinkable. There is no question that the winery can produce great wine, so I’m very anxious to see what they do with their own fruit. After I sampled the last wine, the tasting-room manager disappeared into an adjoining room and came back with Stergio Zissios in tow. He is engaging, extremely enthusiastic and operates with a kind of energy that makes it easy to see why things run so smoothly. Stergio answered all of my questions while shepherding me through the tasting rooms. Then he led me downstairs into the winery and tasting room. The stonework in the basement gives the space a castle-like feel. It is a cavernous space that contains an enormous barrel room and a 25,000 case capacity winery. The most impressive aspect, however, is a dining space that is meant for weddings and other special events. It is beautifully apportioned and tastefully decorated, while retaining that same rustic, castle-like vibe. Future plans include expanding grape acreage from twenty to forty five on the property. Stergio also speculated that more land might be leased. This may be necessary. The goal is to gradually increase production to 25,000 cases. It will be interesting to see, if achievement of that goal leads to expansion of production capacity. Additional landscaping and infrastructure improvements are also in the offing. So we will will see Blue Valley continue to evolve in the coming years. When all is said and one, Blue Valley will potentially be one of the largest wineries in Northern Virginia. There is a plethora of activity and exciting developments on the property. So after all that I have told you, if you are not convinced to visit, then I am not sure what else I can tell you. On the other hand, should you happen to stop in, please let me know what you think. 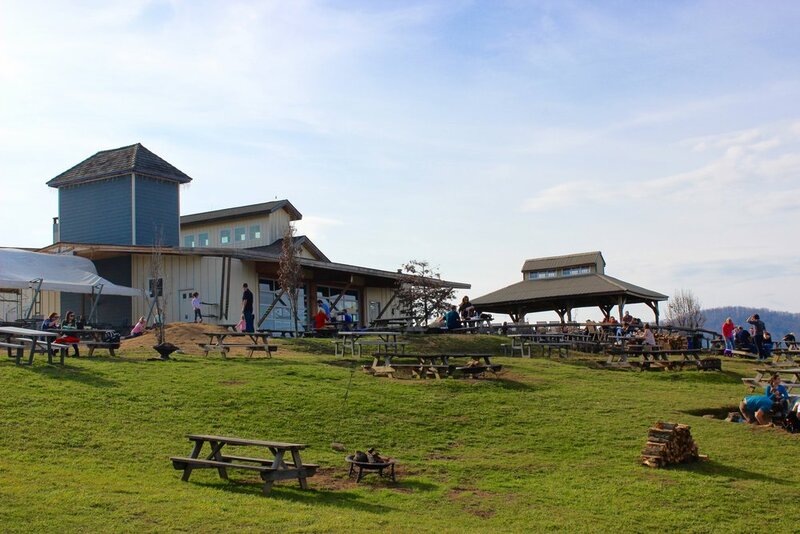 I recently published a list of wineries with great views and received a query from a reader asking “what about Bluemont?” So I vowed to get out there as soon as possible and I could not have picked a worse day. It was rainy and overcast, so the view was obscured. Nevertheless, I’m glad I made the trip, because the winery was a real find. The tasting room is perched on the hillside at an elevation of 951 feet overlooking the vineyards and farmland in the valley below. It’s a beautiful chateau-like building that opens into a deceptively spacious interior. There are two floors with multiple tasting bars, lots of little corners to explore, seating throughout and local handmade gift and home decor items dispersed throughout the building. Outside, there is covered seating on both levels and indoors you can find music most weekends and lite food is available from the kitchen. The first vines planted at Bluemont were Norton, because they are a local varietal. But by the time the tasting room opened in 2007, most of the international varietals were represented in the vineyard. The winery produced 6200 cases in 2013 and enjoys a reputation as a producer of world-class wines. Every effort has been made to produce the finest possible product at Bluemont. Experts from Virginia Tech were brought in to analyze the growing conditions and make the best recommendations. So there is great emphasis on terroir and the vineyards slope down from an elevation of 1100 feet, which seems ideal for drainage of excess water and cold air. In addition, Doug Fabbioli, owner of Fabbioli Cellars and one of the regional wine rockstars, is the consulting winemaker, which seems to increase Bluemont's likelihood of success. Meanwhile at the tasting bar, I drew Christina as my wine steward. Her affiliation with the winery has been short, but she brings a love of wine to the task of pouring and she’d clearly done her homework about the Bluemont wines. She conducted the tasting in a well-ordered, but informal fashion and we had a great conversation about each of the offerings. She was concerned about being able to speak to all my questions, but I thought she did a fabulous job. Oh the wines! Bluemont produces wine using most of the typical international varietals that you can find growing throughout the state. Of course there’s the Norton as well. All were very well made, but there are a few very special wines on the menu. The Farm Table White and Farm Table Red are the most popular overall. The white is a dry blend of Vidal Blanc, Petit Manseng and Chardonnay. It has crisp peach notes with a bit of citrus in the finish. The red is light and fruity with a bit of spice. Particularly for a someone new to red wines, I think this one is particularly approachable. Both were lovely and I totally understand the popularity. I, on the other hand, had a couple different favorites. The Peach is a blend of Rkatsiteli and peach wines. Wow! That was unexpected. Of course, as you might imagine, there were distinct peach notes. The Rkatsiteli, however, added quite a bit of complexity to this very dry semi-fruit wine. It could be a sipping wine, but will do much better with something off the grill. The 2010 Merlot was my overall pick. It’s blended with just a bit of Cab Franc and Petit Verdot, but the amounts are too small to make it a legitimate Bordeaux blend. It had the typical cherry on the nose and palate, but without being too fruity. It had a bit of complexity and finish to write home about. Loved it! So I still haven’t seen the view, but in the immortal words of Douglas McArthur, “I shall return.” In the mean time, even without seeing the fabled panorama, I can easily put Bluemont Vineyard in my top ten. Everything about my experience was first rate. The service, the knowledge of the staff and the wines put this winery in the upper tier. You should seriously check them out, but pick a better day than I did. 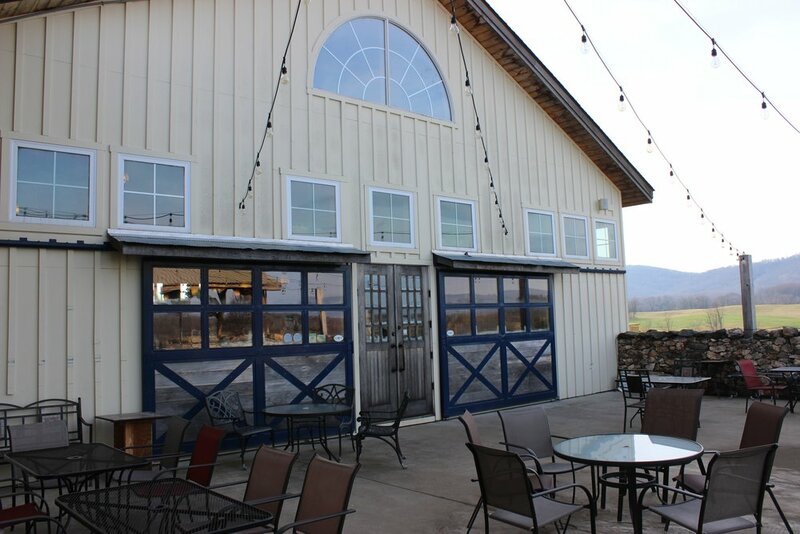 Driving west through Loudoun County, just before starting the climb up the Blue Ridge, you’ll find a tasting room on the side of Route 7. Bogati Bodega is appended to the end of long brick structure containing other businesses. It’s not exactly what I expected, but then I never know exactly what to expect. Jim and Della Bogaty are the owners of Verimar Vineyards, which is just a little further down the road, on the other side of the mountains. They received the bodega inspiration during a trip to Buenos Aires. So in 2010 they opened the doors at Bogati. The grapes are grown on the Verimar property and their son, Justin Bogaty, makes the wines that carry both the Verimar and Bogati Vineyards label. I tasted eight wines during my visit. Most of the wines were crafted from the international varietals encountered throughout the state, but there were a few less common grapes. You’ll find Albariño, Touriga Nacional and Malbec in wineries other than Bogati, but they’re far from the norm. I discovered that most of the white wines tended to be slightly sweet. This was even true of the Albariño, which had about 1.5% residual sugar. Non-traditional though it was, it did have nice honey and pear notes. Among the red wine offerings, the Malbec had lots of nice black fruit, round tannin and a nice long finish. The Touriga Nacional was showing lots of red fruit on the nose and palate and also had a great finish, but it was only a couple years old. The tannins should mellow nicely in the Touriga and in a couple more years, this one will be a fabulous wine. All of the wines were well crafted, but I mention these because they’re not typical and they make a strong case for a trip to Bogati. The tasting room has a very nice fireplace sitting area that was in use on the raw day of my visit. The bodega also serves up a Blond Sangria made from Seyval Blanc, which will be perfect for the warm days to come. In addition, a variety of lite food is available for purchase and there are frequent public events held on the premises. I had a very educational visit at Bogati. Paul, my wine steward, offered lots of information about each pour and we had a nice conversation about Verimar, the varietals and wine in general. While Bogati Bodega is more of a satellite tasting room, it’s a very warm, comfortable venue. This one is worth checking out. I think you’ll discover, as it did, that there’s a lot going on at Bogati. A panopticon is an institutional building, in which a single watchman can see everything from one location. I’m not implying that Boxwood Estate Winery is an institutional building, but the architectural design does employ a “panoptic” concept. From a single location at the tasting bar, it is possible to see the vineyard, bottling room, fermentation room and barrel room. The building was designed by Hugh Newell Jacobsen, who’s modern, linear design concepts and use of open space will strike you even before you enter the winery. I guess what I’m saying is, it’s worth a visit just to to admire the architecture. So as of this writing, Boxwood has been on the scene for about ten years. The first vines were planted in 2004, the winery was built the following year and the first vintage was bottled in 2006. Today, Boxwood has nineteen acres under vine. They are producing about 2500 cases each year and, with a maximum capacity of 5000 cases, they are likely to remain a small boutique winery. As the story was related to me, John Kent Cooke developed a love of Bordeaux wines and this fueled his motivation for opening Boxwood, which specializes in Bordeaux blends. Now, Cooke's father, Jack Kent Cooke, was a former owner of the Washington Redskins. It seems that the genetic attributes for assembling a team were passed on to the son. In addition to hiring Hugh Newell Jacobson to design the tasting room, Cooke brought in the legendary Lucy Morton to design the vineyard and hired Canadian winemaker Adam McTaggart. In addition, the French wine consultant Stéphane Derenoncourt was retained to help fine tune the winemaking process. With such a team in place, creation of world-class wine was clearly in Cooke’s sights. Boxwood produces three Bordeaux blends and the Boxwood, Topiary and Trellis were all represented during my tasting. The 2011 Boxwood Estate Trellis was quite good, considering the vintage, but paled against the earlier Boxwood and Topiary vintages. The 2010 Boxwood is available only in half bottles, due to diminished stock. It showed strong black fruit and tobacco notes, lots of complexity and a very long finish. While the Boxwood was extraordinary, my personal favorite was the 2009 Topiary with strawberry on the nose and palate, layers of complexity and soft tannins. It was drinking well, but could go longer on the shelf. I found it to be exceptional. I’d heard good things about Boxwood prior to my visit, but one never knows exactly what to expect. I was greeted by wine steward Mark Morency, who guided me through a very relaxed and informative tasting. Assistant manager Jordan Spencer was also on hand interacting with guests. She was good enough to show me around the winery and fill in some of the blanks about Boxwood. It’s easy to think that Mark and Jordan made some special effort, because I was planning to write about the winery, but I watched them with the other visitors and, if anything, they were even more attentive. My experience was first rate and if The Virginia Grape gave awards for customer service, Boxwood would receive the highest rating. With its beautiful tasting room, excellent wine and knowledgeable, courteous staff, this winery represents the whole package. 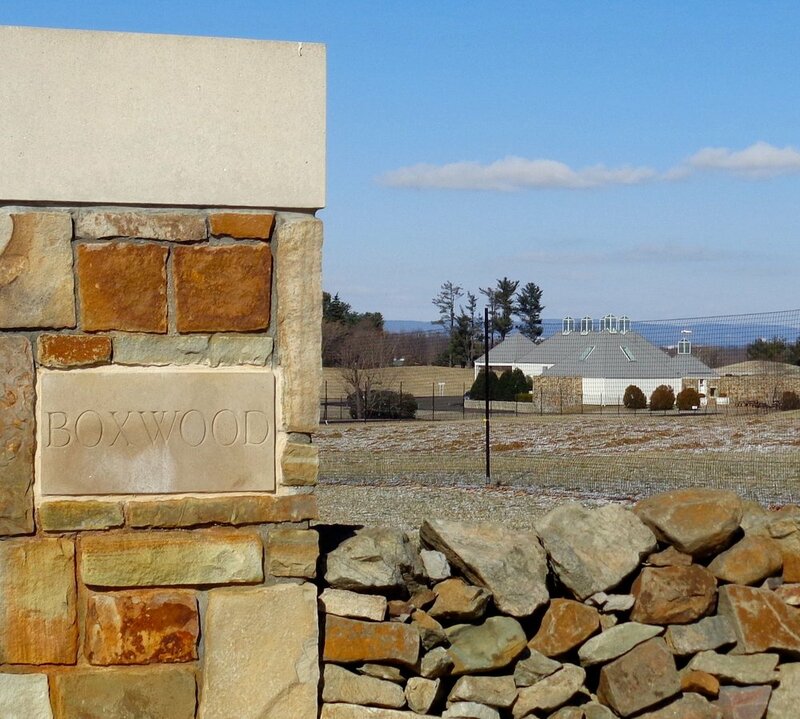 Located only minutes from Middleburg, there are numerous other great wineries in the area, so Boxwood can be one stop in a larger wine adventure. I’d make it one of my first stops and, while it’s still pretty early in the year, don’t be surprised to see Boxwood on my list of top picks for 2014. Paul Breaux opened his winery at a time when many of the questions about suitable varietals and growing techniques had been answered or were better understood. Breaux also opened with a business model that has served the business well and will carry them far into the future as a major industry player. That is to say that great emphasis was placed on site selection and planting of fruit. With viticulture and quality wine production programs well in hand, Breaux Vineyards began making investments in infrastructure. My last visit to their tasting room was probably three years ago. At that time, it was quite small and the staff struggled to keep up with the increasing number of visitors. The new tasting room is palatial in comparison and provides multiple options for overflow tasting space and room to accommodate large tasting parties. The space is both beautiful and well designed. As you can see, there is a lot going on at Breaux. So much in fact that I am 500 words in and have not yet talked about the wine. Breaux, I am pleased to report, is also one of only a handful of Northern Virginia wineries producing a sparkling wine. Many may pour a sparkler and they may even bear that wineries label, but only three are actually producing them. The Breaux sparklers are made on the property with estate fruit in the traditional method (méthode Champenoise). To date, Breaux has only produced a small batch, but 2014 will see the release of a pair of sparklers and this is something to get excited about. I got a sneak preview and they are fabulous. Cana is the place where Christian tradition credits Jesus with performing his first public miracle, when he turned water into wine. It is my assumption that Cana Vineyards and Winery near Middleburg, Virginia is making wine from grapes. Nevertheless, they take their name from this biblical allegory and a visit to the tasting room may reveal something nearly miraculous about the Cana experience. Les Bell, the owner/winemaker at Cana, also has a vineyard in Napa, so he brings experience to this Northern Virginia enterprise. Bell planted his first vines at Cana in 2011, currently has five acres under vine and produced 5000 cases of wine in 2013. With plans to incrementally increase acreage of fruit, the production numbers may rise. We’ll need to keep an eye on Cana and see how things shake out, but Bell’s plan is for this venture to remain a small boutique winery. Many of the Virginia wineries that I visit have lots of energy. This was true at Cana. On the day of my visit, there were large crowds. There was live music on the second floor, customers filled the tables on both floors and tastings were scheduled at regular intervals to accommodate the number of patrons. It was all positive energy. The building was constructed to accommodate large numbers and there were no signs of overt drunkenness, so Cana felt like a nice place to hang out. It has a very upbeat atmosphere. After signing up for a tasting at the downstairs bar, I hovered briefly with the small group scheduled for the 2:30 tasting. The wine steward collected us and led us to an upstairs bar, where she conducted the tasting. Christie works weekdays as a school teacher and pours for Cana on the weekends. She was relatively young, but possessed extensive wine knowledge and clearly loved her part-time job. She engaged well with the customers and educated everyone about the Cana product. I found her to be an excellent representative of the Virginia wine industry. Kudos to Cana, if they are training all their wine stewards as well as Christie. We tasted seven of the Cana wines. I observed that they are using a wide range of different grapes and even have some fruit wines in their arsenal. I loved the lineup of whites. We tried a Viognier, a Rkatsiteli and, a Traminette. These grapes are all completely different and produced a very eclectic lineup of wines. I mean that in the very best way. All were well crafted, but my favorite was the Viognier. It spent six months in neutral oak and exhibited mango and butterscotch, with a nice mouth feel. The reds included a Petit Verdot-Merlot blend named Le Mariage, which was my overall favorite. It was a big, but perfectly balanced wine, with black fruit notes and a beautiful finish. No runt in that litter. They were all very good wines. I had a great visit at Cana Vineyards and they have earned the Virginia Grape’s Legion of Fabulocity, which is presented in recognition of superior customer experience. If that’s not enough to convince you to pay a visit, look at the map. 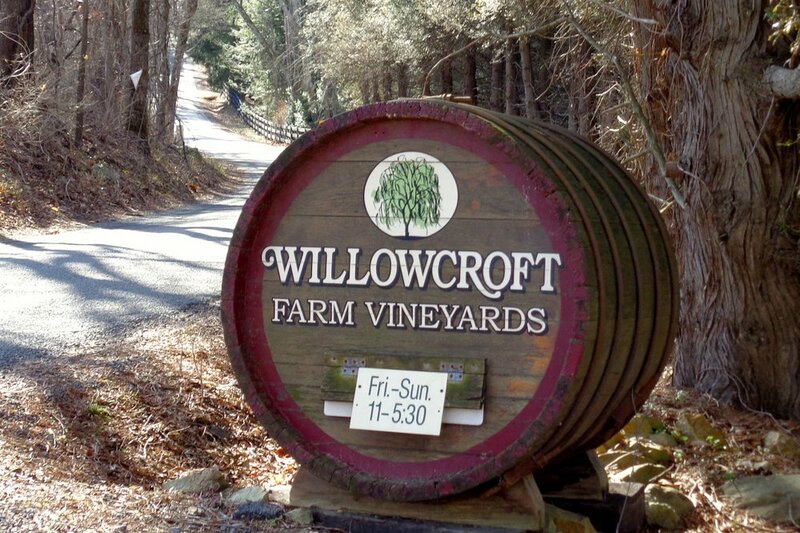 The Middleburg environs are filled with excellent wineries and this is one of them. Make a visit to Cana part of a larger winery expedition. 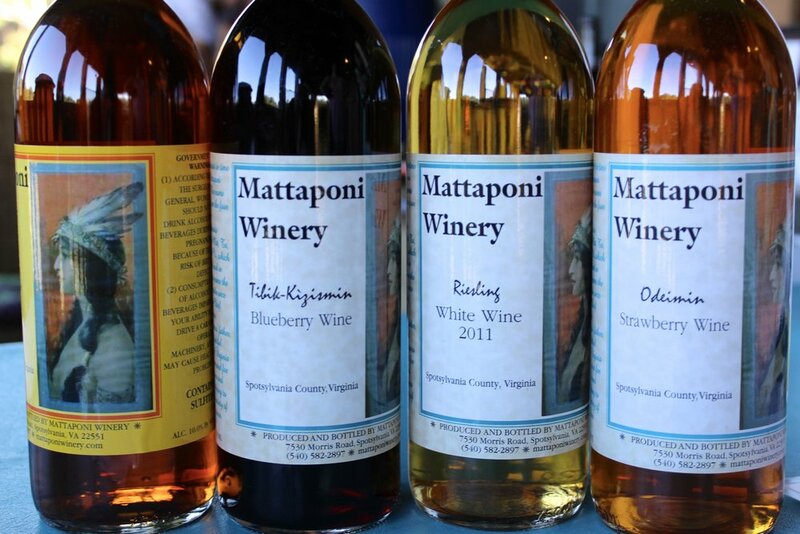 Many Virginia wineries conduct some type of food and wine pairing. Most consist of traditional combinations of wine and some sort of charcuterie. Cardamon Family Vineyards has added its own unique (for Virginia anyway) spin. Chuck Cardamon trained as a chef prior to opening his winery and he happens to specialize in salsa. I’m not saying that is all he does, but salsa is his superpower and he is pairing them with his wines. Cardamon Family is fairly new. They have been producing wine only since 2012. 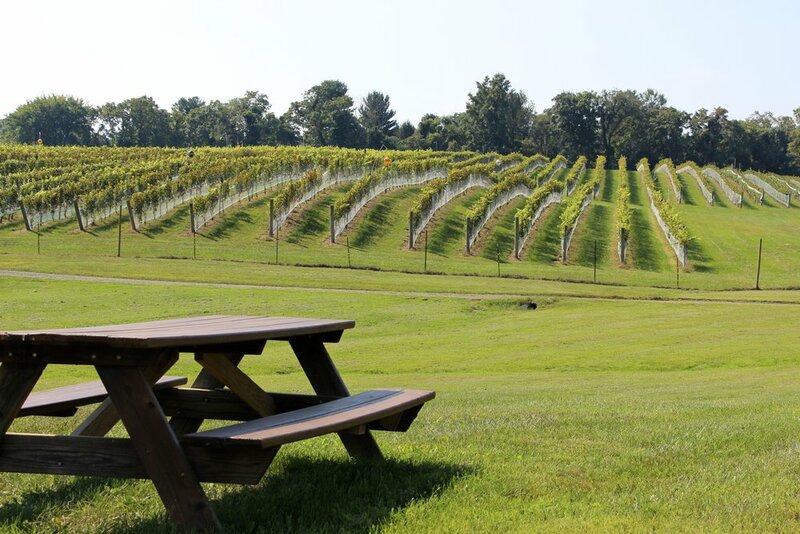 With just 500 vines on the property, most of the fruit is sourced, but they are all Virginia wines. Total annual production is between 500 and 600 cases, so it is a pretty small boutique operation. 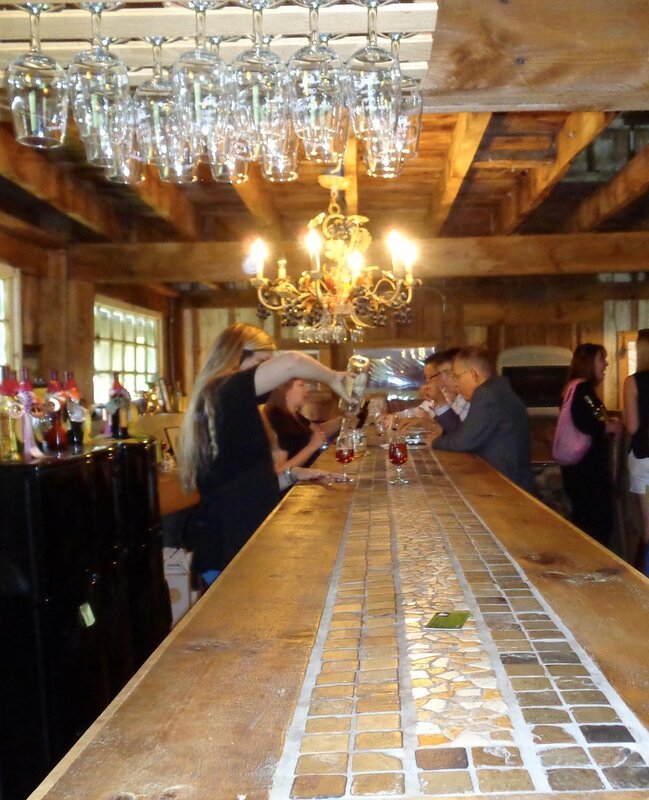 Nevertheless, a visit to the tasting room will reveal well-crafted wine and steady stream of visitors. It is a pretty lively scene. Chuck recently published a Salsavino book that contains 86 salsa recipes. Some of these salsas are available for purchase in the tasting room and there are typically four that are paired with the wines. So every wine will not have a corresponding salsa, but you will find them interspersed throughout the tasting. Now you might be thinking salsa equals hot, but many of them are mild and the concept really works. Ultimately you will have to check it out and form your own opinion. So I sampled four salsas and nine wines. A couple of the pairings included a dry-style Vidal Blanc and a corn salsa. Another (and my personal favorite) was the Reserve Chardonnay and a pineapple, pear, corn and habanero salsa. Again, these did not pack a lot of heat. I will also point out that they were all pretty inspired. I should say a few words about the wines. I thought they were all well made, but as always, I had a couple favorites. The Seyval Blanc, Vidal Blanc, Chardonnay blend was my favorite white. It was done in stainless steel and had two percent residual sugar, but it was a perfectly balanced, food-friendly wine. My top pick of the tasting was the Cabernet Sauvignon-Cabernet Franc blend, which was paired with a red, white and blue salsa. It was a medium-bodied red that spent eighteen months in oak, but still showed nice fruit and beautifully structured tannins. It is a potential award winner. I really enjoyed my visit. I found the entire experience to be both educational and entertaining. Many of the visitors appeared to be regulars, which I think speaks volumes about the wine and the venue. I intend to be one of those repeat visitors. So if you have not checked out Cardamon Family Vineyards, it is high time that you venture out there. When you do, please let me know what you think. 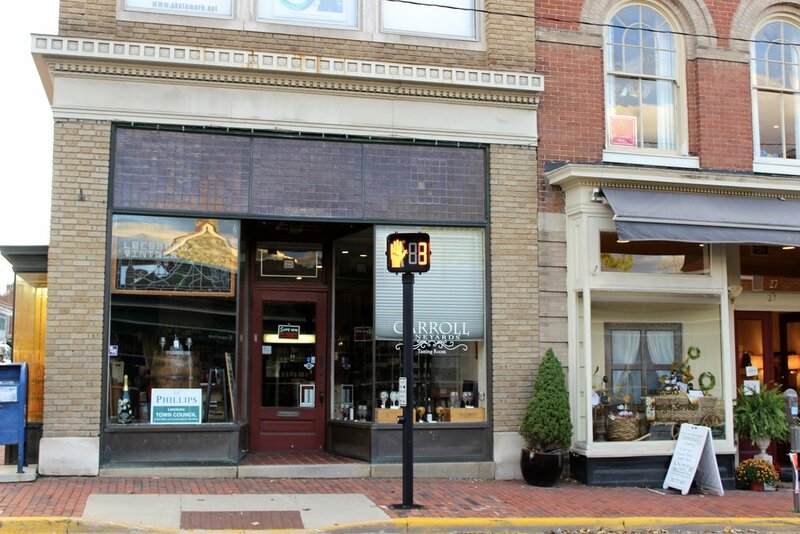 Old Town Leesburg in Loudoun County, Virginia is a fun little space filled with shops, restaurants and wine bars. Tucked in among these other establishments is the Leesburg Vintner, which has been selling wine since 1986. 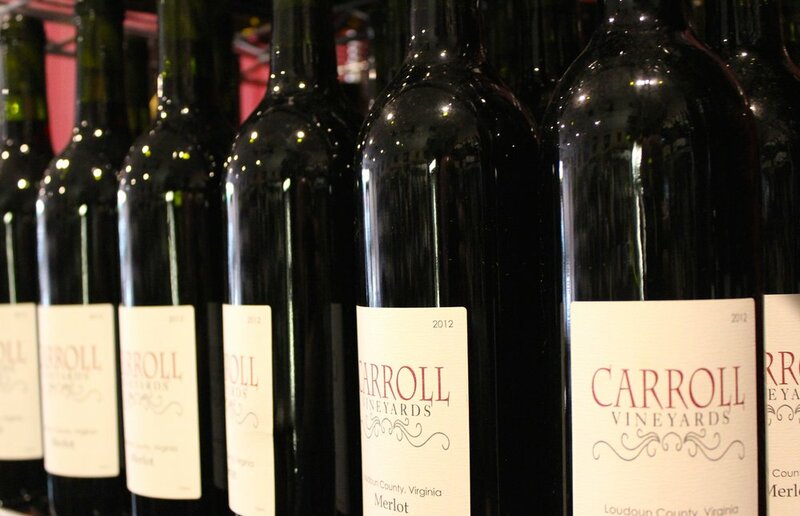 Beginning in 2012, the wine store also became home to the Carroll Vineyards tasting room. I stopped by late one fall afternoon. I found the tasting room located on the corner of King and Loudoun Streets, wandered in and had a seat at the end of the long tasting bar. Mike Carroll was pouring wine and he was able to provide a little background on the winery as he poured. Mike has been in the wine business since the mid 1970s and travels nationally and internationally to visit wineries. Living, as he does, in the Middleburg American Viticultural Area, it was just a matter of time before he took the next logical step. He planted vines in Paeonian Springs and leased other vineyards in Loudoun County. To make the wine, Mike brought in the legendary Lori Corcoran, which was something of a brilliant masterstroke. As of this writing, Lori is producing between 350 and 500 cases each year for Carroll Vineyards. The wines are made from seven different grape varietals and a single apple wine is also on the tasting menu. I was able to taste five of the Carroll offerings during my visit. The Traminette, Chambourcin and Merlot were all well crafted, but the Cabernet Franc and Petit Verdot were of particular note. The Cab Franc showed a lot of character, notes of red fruit, a lovely mouthfeel and a hint of pepper in the finish. The Petit Verdot was a big, inky wine filled with fig and cassis. The finish on this one was something to write home about. It was my hands-down favorite. If you’re in Leesburg, you should make it a point to stop in. I found Mike and his staff to be extremely friendly and the tasting was well done. It was informative and educational, which are both attributes I like to see in a tasting. When you do stop in, I’d love to hear what you think. At last count, I think there are 46 wineries in Loudoun County, Virginia. Most of them are making good wine. A smaller number are making great wine. Casanel Vineyard falls squarely in this latter category. I try never to do rankings, because they are so subjective. After lengthy deliberation, however, I can say that Casanel is easily one of my five favorite wineries in all of Northern Virginia and rests squarely in the top tier of producers in the state. It is quite possible that you are unfamiliar with this winery. They are flying a little under the radar. 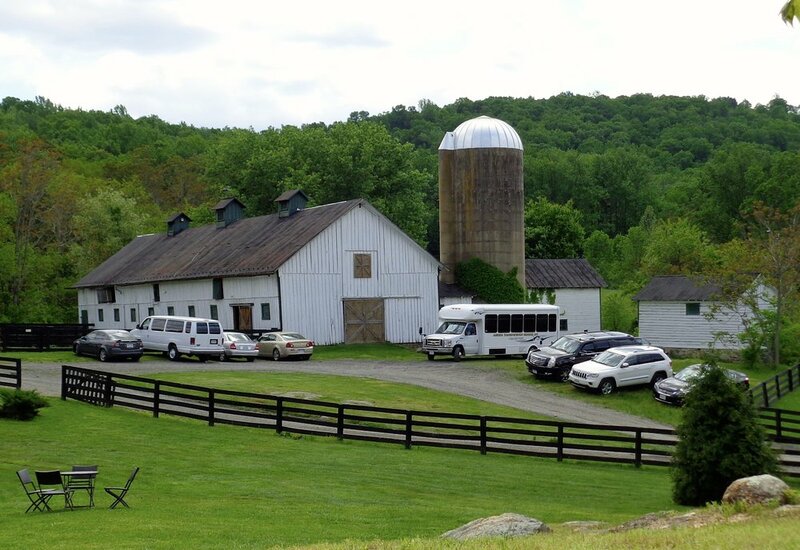 It is not one of the “party” wineries with a parking lot full of busses and limos. They do not court large crowds of weekend revelers from the DC area. Instead, they have positioned themselves as one of the few wineries focused on exclusive, education-oriented tastings. Whether you walk in and do the regular tasting or make reservations for one of their small-group, directed tastings you will be attended by a staff member that understands the wine and can speak with authority about the Casanel program. Nelson and Casey DeSouza opened Casanel in 2008 and currently have about ten acres under vine, which are producing between 1000 and 1200 cases of wine annually. Daughters Anna and Katie are part of the management team and it is Katie, along with Katell Griaud, who makes the wine. To the best of my knowledge, this is the only all-female winemaking team in the Commonwealth and they have an average age of no more than 30. You can imagine that some members of their craft do not take them seriously and that is a mistake. They are making extremely well-crafted wines that demonstrate perfect balance and finesse and they are just hitting their stride. I predict that we will be hearing much more about Casanel wine in the coming years. I almost never make an appointment for a tasting. It is my general policy to show up unannounced, so the winery does not prepare for my visit. In this case, however, a friend had recently been there and insisted that Casanel needed a fresh look. Things do evolve and I had been planning to stop in again, so I agreed on a date and he made an appointment with Katie for a private tasting that would include some yet-to-be released gems. I will tell you more about that in a minute. I arrive just as my friend was getting out of his car, so we wandered into the tasting room to find both Nelson and Casey waiting for us. Katie was setting up in the old stone tasting room that now serves as a special event and wine club facility. We walked over with Nelson, bellied up to the bar and let Katie step us through the lineup. We started with a pair of Pinot Gris. One was done in stainless steel and other saw a little time in oak, but only enough to give it a little more density along with some vanilla and coconut notes. We moved on through a lovely Chardonnay and tasted a very nice, dry-style Rosé. I could go on at length about any of these wine, but I want to spend a few lines talking about the first red offering. Casanel is producing a Carmenère. If you are unfamiliar with this grape, it was once widely grown in Bordeaux until it was nearly wiped out by phylloxera and it is now one of the main red varietals of Chile. Other Virginia growers have attempted Carmenère, but found it unsuitable for local conditions. Small amounts are still grown and used exclusively for blending. In short, it is not a grape we encounter in the Mid Atlantic… until now. Casanel is not only growing it with success, but had a banner year in 2015. Their Carmenère beat all other wines in the Grand Harvest Competition, which is limited exclusively to wineries located in an AVA. So this is something to get excited about (especially, if you are wine geek like me). As I alluded earlier, we were getting a sneak peak and while others are blending with it, Casanel is producing a single varietal. Katie opened a bottle of the 2014, which will be released in August, and poured us a barrel sample of the 2015. Carmenère makes a deep red wine with a rich bouquet, hints of cassis and firm tannins. I found the 2015 to be more fruit forward, but that profile will almost certainly change between now and its release. It will be interesting to see how the Carmenère evolves and, come August, I will be queuing up to buy some. We also tasted a very nice Bordeaux blend, a Cabernet Sauvignon, a Petit Verdot and a Norton Port-style wine that was aged in Cognac barrels. I was very fond of all four, but the Petit Verdot and the Norton dessert wine were my top picks. The Petit Verdot was garnet in color and full of dark fruit and firm tannins. It is no surprise that it has won medals in numerous competitions. The Port-style Norton picked up hints of Cognac from the barrels. That may be what drew me to it. I am not one who typically raves about dessert wines, but this one is special. All in all, it was an eye opening visit. When I was there a couple years ago, Katie was behind the wine bar and she poured my wine. I was impressed by her and I enjoyed the wine, but not completely blown away. Katie and Katell have certainly taken it to the next level (maybe even two or three levels). If you have a short list of wineries you want to visit, move Casanel to the top. I think you will come away as excited as I am. So after you stop in, please let me know what you think. My GPS led down a gravel road near Purcellville, Virginia and then up a driveway to a private home. The address was correct, but there were no signs indicating that this was in fact Catoctin Creek Winery. I gathered my things and walked around to the front of the house. Before I could ring the bell, owner and winemaker Jim Hanna opened the door and welcomed me to his unlikely winery. This is not the smallest winery I have ever visited, but Catoctin Creek is tiny even by boutique standards. Hanna sources his grapes from Breaux Vineyards and then transports the fruit by car back to his basement winery. A pair of sliding glass doors open onto a patio that serves as the crush pad. Inside there is a tasting bar for the occasional visitor along with all the tools necessary for making wine (on a fairly small scale). Hanna produces about 300 cases annually and there are no plans to expand beyond that number. It is tempting to look at his basement operation, consider the volume of production, and think of Hanna as a wine hobbyist. There are much larger operations in the Commonwealth that I might lump into that category. In any case, it is not always size that counts. I am disinclined to tar Catoctin Creek with that brush. Hanna has worked hard to learn his craft. He has consulted and learned from local greats like Doug Fabbioli and Dave Collins. He has a dog-eared copy of The Backyard Vintner (Law, 2011) that he used as an early reference, but Hanna has moved past the point of early trial and error. It is fair to say that Catoctin Creek has moved beyond the tipping point to become a commercial producer of fine wine. I tasted seven wines during my visit. Aside from a very nice, dry-style Merlot Rosé, my tasting was limited to the Catoctin Creek reds. Cabernet Franc seems to be a strong suit. As you might suspect, the 2011 was a bit on the light side but had nice fruit and no hint of green pepper. By contrast, Hanna opened a 2010 that was simply over the top. It has matured well with earthy, cigar box notes on the nose and mature fruit with structured tannins and a hint of black pepper in a very nice finish. I also tasted a Syrah, Malbec and Petit Verdot. All were respectable and drank quite well. The 2012 Meritage was another homerun that was featured in the 2015 Governor’s Case. All were uniformly well crafted and indications of a winery that is at the top of its game. I must point out that Catoctin Creek Winery is not open to the public. At one time it was possible to stop in with an appointment, but that is no longer true. Hanna markets his wine to retailers and restaurants throughout the state. The website contains a list of retail clients. I wish I could recommend stopping by the tasting room, but I can encourage you to visit the website and look for a bottle of Catoctin Creek wine. As always, I am very interested in hearing what you think. 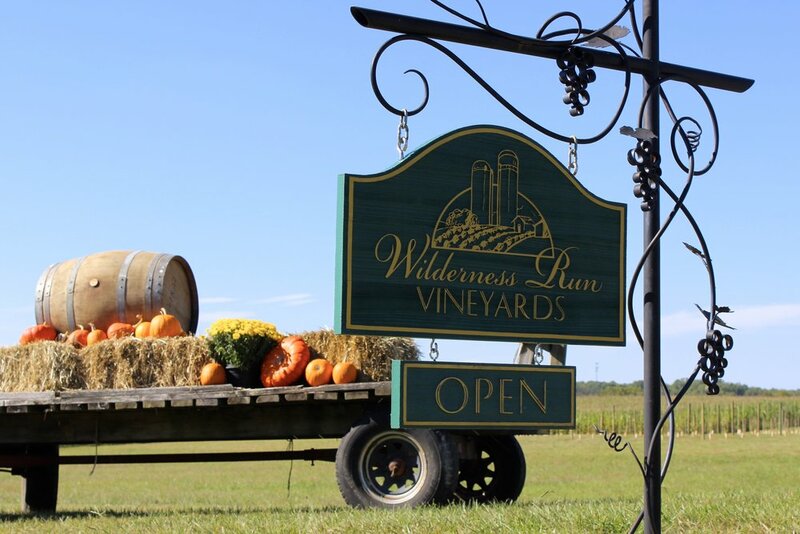 In the very southwestern corner of the Middleburg AVA, not far from the Blue Ridge and the Appalachian Trail, there is a relatively new winery that has already established itself as a producer of world-class wine. Chateau O’Brien at Northpoint is all about making the best possible wine. Arriving at Chateau O’Brien you’ll first notice the unobstructed view of the Blue Ridge as you look out across the vineyards. The tasting room is just up the hill in the original farmhouse that has been remodeled and the interior rebuilt to suit its current purpose. The elevated deck that has been added to the rear of the building offers a similarly spectacular view. Howard O'Brien started planting his grapes in 2000 and let the vines mature for six years before bottling the first vintage. Today there are about forty-five acres under vine and Chateau O’Brien produces about 2200 cases each year from 100% estate-grown fruit. Howard brought in Jason Murray to manage the vineyard and also challenged him to make the wine. This is often an optimal scenario and many of the best winemakers are also winegrowers. The perfect marriage of these two skills is evident in the quality of the winery’s offerings. There are two tasting options available. Whites and reds are tasted in different rooms, which limits the possibility of contamination. Actually, I made that up. It really helps disperse the crowd, limits the wines poured at each tasting bar and restricts the discourse to a smaller wine list. It’s the first time I’ve encountered this arrangement, but it seems to work. The reputation of Chateau O’Brien is built on its reds and so I elected that option. All of the Chateau O’Brien reds spend twelve to twenty four months in French oak and as I said earlier, they are produced exclusively from estate-grown fruit. There were four wines on the regular tasting menu. First was the Malbec. It was a medium-bodied wine that was showing great structure and lots of black fruit. I was thinking it would be a hard act to follow, but the Cabernet Franc was even more fabulous. The oak lent some complexity without overshadowing the fruit and it had a beautifully long finish. So I thought I’d found my favorite, but then I tasted the Petit Verdot. It proved to be even better, with its dark fruit, spice and complexity. This proved to be one of those tastings where each wine was better than the one before. The final selection, the the Northpoint Red, was hands-down the best of the lineup. It’s a Merlot-heavy blend of all the Bordeaux grapes. Twenty months in French oak imparted a great deal of character. It had lots of red fruit on the palate with a finish that just kept going. It demonstrates what’s possible with a Bordeaux blend in Virginia and certainly merits its price tag as one of the Commonwealth’s most expensive wines. There are a couple other more exclusive tasting options available. There are Private Reserve Cellar tastings and vertical tastings of the late-harvest Tannat. I’m told that the Tannat is potentially one of the best in the United States and has been officially recognized by Uruguay. That’s saying something, because Tannat is Uruguay's national grape. Both of these options are by appointment only. I do intend to return and avail myself of these other opportunities. At a minimum, I’ve got to taste the Tannat. This is a winery that doesn’t host a bunch of public events to try and draw a crowd. They don’t need to. Patrons visit because of the wine. 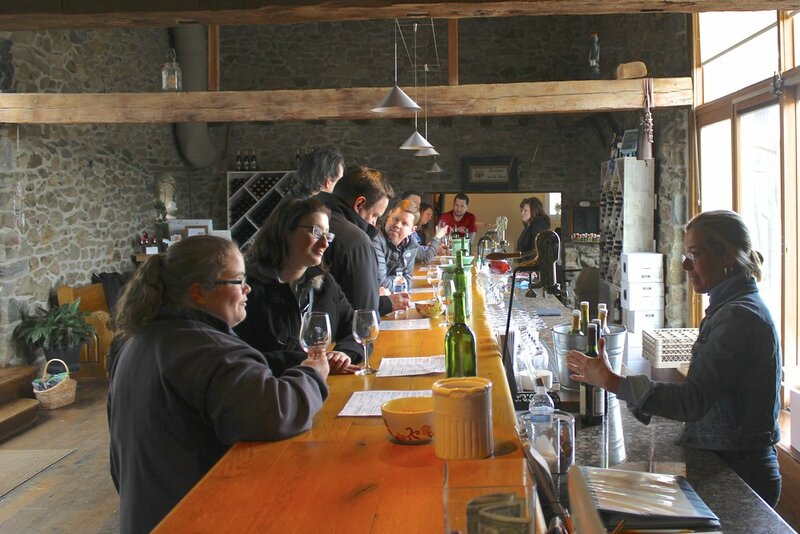 What Chateau O’Brien does do, is take the time to explain the wines and educate each visitor. 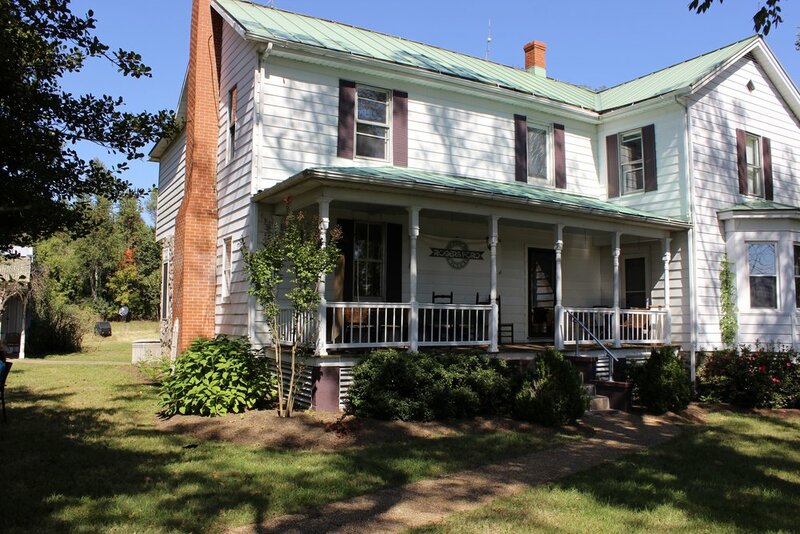 If you are interested in seeing the quality that is possible in Virginia wines, this would be one of your stops. As we turned off of Zachary Taylor Highway and started down the drive to Chester Gap Cellars, we could just see that this would be an amazing view, if only the weather were a little better. It was yet another grim and rainy day in a season that has been filled with grim and rainy days. I'll go have to go back for better pictures, but at least I was still able to try the wine and find out a little bit about Chester Gap. 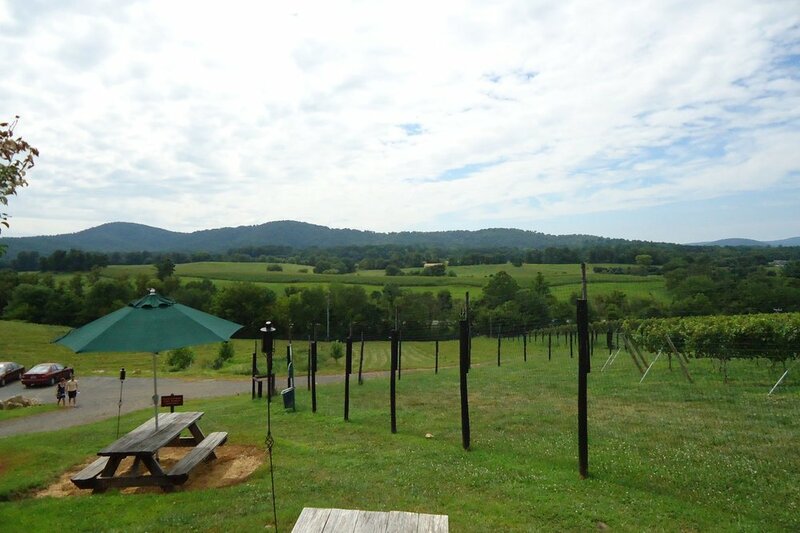 Chester Gap is a small boutique winery located near the Blue Ridge at the intersection of Warren, Rappahannock and Faquier Counties. In addition to about a half dozen wineries, the immediate area has access to outdoor activities and beautiful little historic villages that are snuggled up against the mountains. We tend to be a bit jaded in Central Virginia and often forget how beautiful this part of the state can be. The Chester Gap vineyards were planted in 2000 and the first vintage was bottled in 2004. Until the tasting room was opened in 2006, the owners were only open for business in fair weather, so that tastings could be done outdoors. All of the wines are produced from the nine and one half acres of grapes cultivated on the property and annual output is somewhere between 1500 and 2000 cases. The Chester Gap wines are very well crafted. All of the wines were good, but there are a couple in particular that I thought had real merit. The 2010 Vintner's Red was just released. It was so recent, that the tasting menu didn't yet reflect the change. So when I saw the 2010 come out, I was both surprised and excited. It's a great year, so I had high expectations and I was not let down. This is a remarkable wine. It's a Bordeaux blend of Cab Franc, Petit Verdot and Merlot, so it's a pretty big red. The nose is full of black fruit and in the mouth there was more black fruit with lots of complexity, but also a bit of tannin in the finish. This wine is made to cellar and probably needs a couple more years in the bottle, but it's a real winner. My favorite white was the 2011 Cuvee Manseng, which is a blend of 60% Petit Manseng and 40% Viognier. The wine has a big bouquet of pineapple, and on the palate there was more of the pineapple with a bit of grapefruit in the finish. It's an off-dry wine with nice balance and great mouth feel. In trying to point to a favorite, I was torn between the Cuvee Manseng and the Vintner's Red. I liked different things about each of them. I have to give big kudos to the winemaker, they are both excellent wines. It was a slow day, so there was only one other couple tasting when we arrived. I'm sure the weather was keeping people indoors. That's the only advantage to bad weather. We didn't have to contend with crowds. I will say that the tasting room is not set up or staffed to handle large numbers and buses and limos are prohibited. I can't tell you how many times I've arrived behind a bus or limo, so I do appreciate that restriction. Our wine steward, Ashleigh, was outstanding. She had real knowledge about the wine, the winery operations and all of the background information. We were not rushed and I left feeling like I learned something about the wine, which is always appreciated. I will definitely stop in again. I've got to go back when the weather is better, so I can admire the view and get those perfect photos. All in all, even on a rainy day, this was a nice stop.